We have received several questions about the upgraded Syma x8sw (from Syma x8) vs Syma x8w. Hence we feature this comparison – Syma x8sw vs. Syma s8c vs. Syma x8w. Let’s review their similarities and differences, shall we? These three Syma X8 products all fall into a similar price range – under $100. All three Syma drones are suitable for beginners. The affordable price tag and ease of use makes these quadcopters great beginner quadcopters. All three Syma drones come with a built-in camera and ground control unit. These Syma quadcopters are very popular and well-liked by owners. The propellers are easy to pop on and off (compared to the older version of Syma x8). The landing gear are easy to put on and off too. The transmitter is more compact (compared to x8). The camera is 2 mp HD and takes 1080P or 720P videos. Altitude hold for taking stable pictures. This is an outdoor drone. Of course, it can fly indoors if you have a fairly big room. It can do 3D flips – forward/backward, up/down, and left/right. Headless mode – allows sideways or backwards flight. Flight time is about 9 minutes. The drone weight = 1.36 lb., the transmitter = 0.5 lb. There is a SD slot on the drone. You can record video directly to your phone and to your SD card simultaneously. Two speed modes: low and high. A good feature for a beginner to start with low, and progress to high. Bright LED’s for night time flying. Syma X8C Venture drone fits into the hobby grade as an affordable aerial photography drone. The camera is 2mp and takes HD quality pictures. 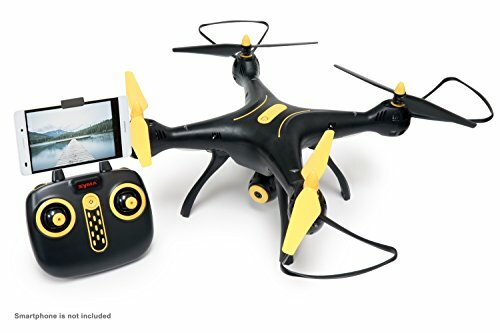 The Intelligent Orientation Control mode helps a beginner learn to control the quadcopter sooner and take high quality video earlier in the learning process. This quadcopter is an outdoor drone. If you want to fly it indoors, make sure you have a large room. 360° Eversion. This Syma can do continuous roll and 3D flips in a variety of ways. For those of you who like night time flying, this Syma comes with colorful flashing light. You get 5-8 minutes of flying time. 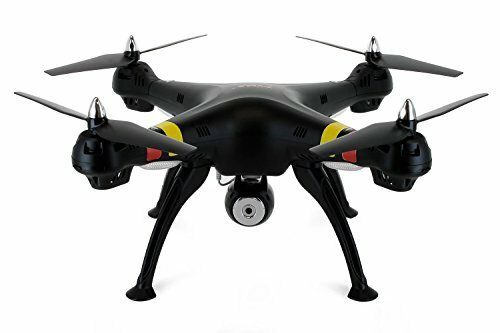 Syma X8W drone is an affordable, higher-end hobby grade aerial photography drone. The camera is .3 mp and will take HD videos. The ground station transmitter can control it up to about 100 meters. One button take-off and landing. 3D hold, Intelligent Orientation Control (IOD). Syma’s IOC mode allows you to go forward/backward, left/right or even sideways flight. 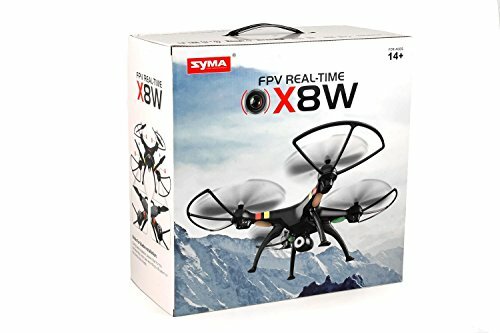 Syma X8W is an indoor/outdoor drone. It can do 3D flips. It has LED lights for flying in low light conditions or evening. All three Syma drones – Syma x8SW, Syma x8C and Syma X8W, are affordable and very good beginner camera drones. Your choice is really based on your preference of having streaming capability, a lighter or heavier drone, pixel quality, flight range and flight time. Who should buy Syma x8SW? A beginner who like aerial photography and want to stream video directly to your phone or tablet. This quadcopter provides you with the WIFI option to do so. The limitation of Wi-Fi is the signal strength – you get less control distance, about 40m vs. transmitter control range of 50m. The Syma X8SW targets beginner looking for smooth pictures and not very concerned about weight. Ok if it can’t fly in a breeze. Need longer flight & play time. Who should buy Syma x8C? If you prefer to control the camera using the buttons on a transmitter, Syma x8c is for you. The Syma X8C targets beginner concerned about weight. This Syma is for a drone pilot interested to fly in a breeze. Better camera quality. Who should buy Syma X8W? The Syma X8W targets beginner looking for smooth pictures and higher pixel camera quality. It’s more suited for a drone pilot who is not very concerned about weight. Ok if it can’t fly in a breeze. Do not require long play time. Check out our review series on beginner drones for adults.